More Retro Studios Rumors Emerge, Could Retro be Working on HD Zelda? Which begs the question: what has everyone been begging them to do? Well, the first thing that comes to mind is obviously “more Metroid Prime,” but Retro’s been pretty clear that Nintendo has steered them in other directions and that they won’t be returning to the Metroid series for some time. With Donkey Kong Country Returns having proven pretty popular, it’s possible that they’re referring to a sequel of some kind, but wouldn’t it make more sense to drive a sequel on the same platform instead of the successor? But then this doesn’t sound like the “project everyone wants us to do” touted in the rumor report. Of course, there is a certain project that we’ve seen pretty much every major site in the gaming world speculate on, and that’s… a Retro Legend of Zelda game. It’s something we here at ZI have actually talked about before, and it’s something that was actually supposedly happening if rumors that circulated from IGN a couple years back are to be trusted. Frankly, after seeing the magic they’ve made with the Metroid and Donkey Kong Country series, yeah, giving them another shot at redoing a classic Nintendo franchise does sound exactly like what everyone wants. And given their eagle-eye attention to detail, as we saw with their previous projects, giving them the reins on an HD Zelda title sounds like something that’d be right up their alley anyway. They pretty much nailed the environmental thing in Metroid, to the point that many consider the Prime games the gold standard for future games in the series. We’ve also seen that they have a really good sense of quality gameplay and that those intuitions apply even across the boundaries of genre. 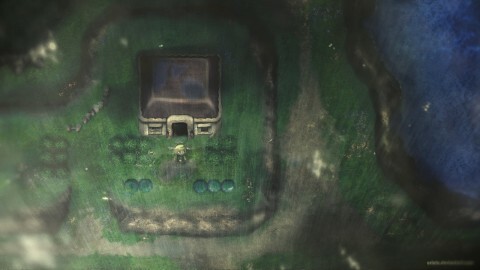 Besides, there’s a sense that Western gaming sensibilities have produced better-quality games, especially in the RPG department – although this could be due more to a decline in the JRPG genre than any particular excellence attributable to Western RPGs – and goodness knows Zelda‘s been yearning for a good injection of More Awesome. But there’s always the possibility that Retro’s referring to something different. A Retro-made Star Fox has also been a pretty popular idea, as well as a true first-person shooter. I suppose there’s always the possibility that it’s a born and bred Retro-exclusive series – but I dunno; when I first sat down and read it the word “project” instantly clicked in my head as “Nintendo franchise.” Whatever it is, though, from the moment it’s revealed to us and over the couple years or so before we finally get to play it, I think everybody will be drooling over it. They seem to have that effect on people.